At Rick Mather Architects, for the developer Almacantar, the £150mil refurbishment of the 1967 Grade II Listed iconic tower in Central London is nearly complete and will open in 2018. Currently under construction, the new proposals will transform the office building into a new residential use tower with retail, restaurants and a major public space at its base, created by significant transport changes and removal of the road that passes below. 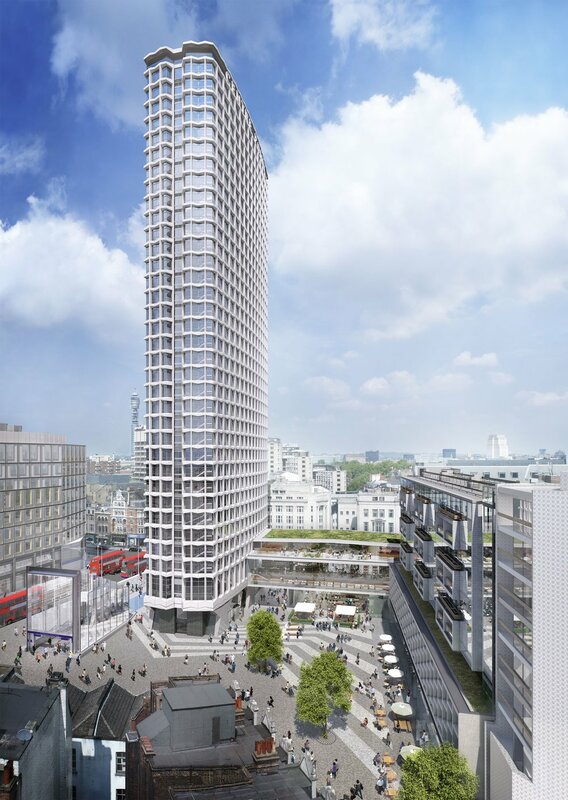 Transforming how the Sixties building meets street level, a major new public square will be created comparable in scale to some of London's most famous squares. This will be a vibrant and unique public space, activated by three levels of restaurant and retail spaces that re-establishes the connections between Oxford Street and Covent Garden. The new retail spaces have been meticulously carved out and revealed from the complex and highly engineered stack of office floors within the Centre Point link and house buildings. Extensive demolitions allow us to reveal the heroic, beautiful and eccentric character of the original design alongside restoring original finishes. A new-build affordable housing block has been added at the southern end that defines a new public space opposite St Giles Church. This employs pre-cast concrete patterned cladding, using a pattern design developed with Eley Kishimoto and derived from a contemporary reworking of the original 1960s elements.